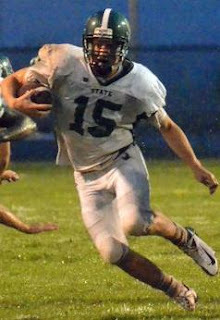 Free State's Kyle McFarland. LJWorld. Strauss threw the ball exceptionally well in week one given the rainy weather, and his numbers were about right where we'd expect them to be. The main caveat was that he threw two crucial interceptions and his team lost. Expect a better showing from him in week two. 2. Jason Randall, Running Back, Lvnwrth. I've seen three different reports of how many yards Randall rushed for but we know for a fact that he had an incredible game. So much so that he elevated himself to the #2 spot on the Player Ratings. Keep it up and he may find his way to the top of the list very soon. McFarland showed just how dangerous he and his Free State comrades can be even when they don't pass the ball. He threw three times on Friday and the Firebirds still managed to score 37 points. Expect plenty more yards through the air (and probably more on the ground, too) in the coming weeks. Darling did an excellent job of playing game manager on Friday. Normally just managing a game well doesn't reap inclusion on this list, but completing over two-thirds of his passes in rainy weather and orchestrating the Lancer offense so well was impressive. We'll see what he can do in dry conditions on turf this Thursday against Olathe North's young secondary. Guild ran hard but his two fumbles, one of which was lost, were hard to overlook especially considering the fact that his team was shutout. I'm anxious to see how he and his Raider teammates respond to their poor performance in week one. Honorable Mention: Brett Sterbach, SM West; Joe Dineen, Free State; Braden Smith, Olathe South; Matt Elliott, Olathe South; Remington Whitley, Olathe South; Judson Cole, Leavenworth; Sawyer Hawkins, Olathe South. *SM Northwest statistics were not submitted for offense or defense. It's hard to complain about rain with the drought we've had... Let's just hope it holds off until after 10 p.m. on Friday night. Then it can pour all it wants. The stats are based on what each school submits to Mid-State Sports Recruiting. They did seem a bit high, but given the fact that Olathe East basically ran the ball up the middle every single play I could see how it played out like that this week. Something to keep an eye on in the future though, certainly. 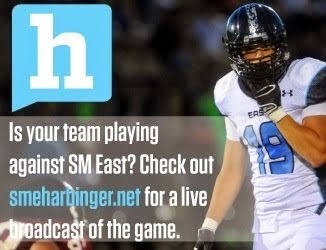 Based on the reported tackles from Olathe South, Olathe East ran over 58 plays from scrimmage last Friday in the muck? Olathe Souths tackle charts are more than iffy. Last year they recorded more tackles than any team in the State. They get awarded a tackle if they breathe on the ball carrier. I know for a fact that East only ran 44 plays last week and some of those were incomplete passes (not very many) LOL and fumbles with no tackler.